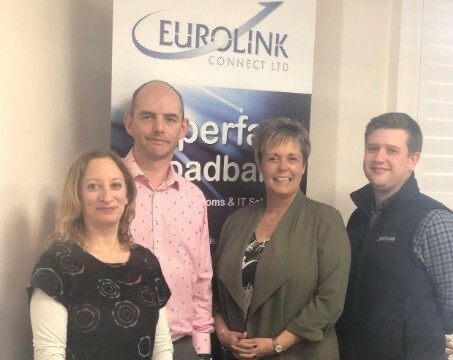 Local telecommunications specialist Eurolink Connect, has announced the appointment of its first female Managing Director, Claire Maddox. Mrs Maddox, has been with the company since 2006, has held the position of Commercial Director at the firm for four years, and has now taken over the Managing Directorship. Having recently celebrated its twentieth year in business, Stonehouse based Eurolink Connect is strengthening its senior management team with the new appointment and has also announced a newly created board to continue to drive the business forward. “This is a really exciting time for Eurolink and I’m delighted to be steering the company to develop and grow the business further,” said Mrs Maddox. As a top communications provider Eurolink has been providing cost effective solutions from its headquarters in Gloucestershire since 1999. Its services include hosted IT solutions & support, mobiles & mobile broadband, broadband connectivity, telephone lines & calls, telephone systems, inbound services, network services and SIP Trunking.